Newsgur USA: Why Kim Jong-un decided to stop nuclear tests in North Korea? Why Kim Jong-un decided to stop nuclear tests in North Korea? Kim Jong-un's announcement that North Korea will stop testing nuclear and ballistic missiles will undoubtedly bring headlines full of enthusiasm, but a look at the history of that country should cool our hopes. First, regarding nuclear tests, Kim makes it clear that he is freezing them voluntarily because he feels that his country already dominates the design and creation of atomic weapons. Although it is complicated to verify, that statement does not seem an exaggeration or an implausible idea. Consider that India and Pakistan, in 1998, had each carried out six nuclear tests and are now in the pantheon of the nuclear powers, without further testing. North Korea, with eight additional years of access to knowledge available in open source material on nuclear weapons design, can feel equally comfortable with its six tests. And if we go into more detail, the fifth and sixth tests, in September 2016 and 2017 marked an important milestone: the first, according to the North Korean media, was made with a standardized and compact device suitable to be mounted on several short missiles, medium and long range. 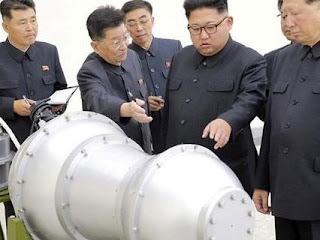 The expected explosive capacity of these weapons may be in the order of two or three times the atomic bomb that the United States launched on the Japanese city of Nagasaki at the end of World War II which is enough for North Korean purposes. And the most recent of the tests showed that it has the capacity to generate very powerful nuclear explosions. While independent experts and Western intelligence agencies do not agree on whether North Korea actually dominates the design of thermonuclear bombs, as they claim, the seismic data collected on September 3, 2017 gave the world enough information to conclude that Pyongyang has devices capable of destroying a city. In addition, Kim's recent trip to Beijing was a demonstration of strength, a sign that he feels his power in the country is sufficiently consolidated to cross the border. This announcement to end the nuclear tests can also be interpreted as a sign of renewed confidence. In addition to freezing nuclear tests, Kim said he will no longer test intercontinental ballistic missiles. And that, on the one hand, is surprising. North Korea has carried out only three tests in total of missiles that could carry nuclear warheads to the United States. None of these tests has involved a missile flying in a trajectory similar to what might be necessary for a nuclear attack on the US, which would suggest that it still requires more flight tests to be able to rely on its ability to attack US lands. But North Korea may have other plans. For example, while it has managed to dominate most of what is technically necessary to threaten the United States, its capabilities are still limited by its small number of launchers. Currently, North Korea has probably only six launch vehicles for its intercontinental missiles. Although Kim Jong-un during his 2017 New Year's speech stated that his nuclear forces were "complete", there is good reason to believe that he would like to increase his launchers and even work on components of the nuclear command and control systems. From a tactical point of view, then, this self-imposed brake on missile tests would have quite limited costs. Ultimately, these self-tests are restricted in their extent. That of the nuclear tests could be made credible by a gesture of good faith in Punggye-ri, where he has carried them out. There he could, for example, demolish his tunnels; the statement published only states that the site will be "dismantled". But as long as North Korea clings to its missiles, it can break its self-imposed ban with little warning time. In 1999, North Korea underwent a missile test moratorium, but it finally broke down in 2006, a few years after the collapse of the 1994 Agreed Framework. Beyond the prohibitions, Kim used the last meeting of the Central Committee to promote the success of his national strategic project, which is summarized in what he has called the byungjin line. This concept refers to the simultaneous development of a powerful state nuclear force together with a more prosperous economy. On his statement, Kim clearly indicated that with the cessation of the nuclear tests, he will concentrate all his efforts on "building a powerful socialist economy and significantly improving the standard of living of the people". That must be taken seriously. North Korea will seek relief from international sanctions at upcoming summits to achieve this goal. These concessions announced by the North Korean leader come on the eve of two important summits, one with the president of South Korea, Moon Jae-in, and another with that of the United States, Donald Trump. One may wonder why Kim gives up so much in advance instead of holding on to this as playing cards when he meets with US President Donald Trump. The answer is simple: a summit with a US president it's a sufficient prize. For Kim, it is something that neither his grandfather nor his father could achieve. In the end, what North Korea loses by demolishing its nuclear testing site and submitting to a one-sided moratorium on missile launches is tolerable compared to what Kim gains by sitting next to President Trump. When reading the announcements of KCNA, the official news agency of North Korea, there is also no indication of the intention of "denuclearization" that South Korean officials have been promoting on behalf of North Korea. On the contrary, Pyongyang's announcement sounds like the declaration of a consolidated nuclear power, a country that does not intend to abandon those weapons that give it the ultimate guarantee of survival. And while President Trump has praised Kim's move as "great progress," the sooner he recognizes Kim's ultimate goals, the better.